I love stories about unsung heroines, so when I scored a signed (!) copy of Aimie K. Runyan’s latest novel GIRLS ON THE LINE it felt like hitting jackpot. Set in World War I, the novel is about the “Hello Girls”, American women sent to work in the field as telephone operators for the US Army Signal Corps. They faced danger from the enemy and endured disrespect from their own military. The women who went to the front lines as operators, nurses, and clerical staff ultimately won the admiration of their male colleagues and in doing so, accelerated the fight for women’s rights. After her brother is killed in the Battle of Cambrai, Ruby Wagner can’t stay home any longer. Although she already works as a switchboard operator for Pennsylvania Bell, she wants to help the war effort more directly. When the Army sends recruiters to identify operators who are proficient in French and competent under pressure, Ruby applies and takes the examinations, if only to feel that at least she has tried. When she qualifies, she has to deal with another obstacle – her parents.They’ve groomed her for a society marriage. something young women in her circle just don’t do. And now that her brother is gone, how can she leave home and cause her parents more worry? But there’s a war going on and times are changing. Ruby enlists in the Army, where she and all the other signal corps women receive further training. They cross the Atlantic to join the troops, always aware that their ship could be attacked by German submarines. In France, there’s more danger and more pressure. Ruby’s team is assigned to one of the towns where the military have set up headquarters and these towns are targets for enemy bombers. The pressure comes from connecting calls while under shellfire, coding and decoding messages, and sometimes translating calls between American and French military commanders, who must coordinate during battles. Delays or inaccuracies could cost lives as well as the battle. Aimie Runyan delivers gripping accounts of non-stop shifts where exhausted operators patch through coded calls during battles, gas masks at the ready. Promoted to chief operator of her team, Ruby faces additional challenges when male officers – as well as one of her own team – contest her authority and judgement. As if all of this wasn’t engrossing enough, there is the added frisson of Ruby’s friendship with an Army medic that’s deepening into something more. Aimie Runyan is a wonderful storyteller and this is a necessary story. I read this book from cover to cover in a single sitting, fascinated by details of the women’s day-to-day lives on the front lines and the irreversible social changes the war brings. It’s been a while since I wrote a book review, and when I do, I like to analyze something about the novel that really worked for me. There is always something we can learn from other authors and I know that many readers who follow this blog are also students of writing so here goes. 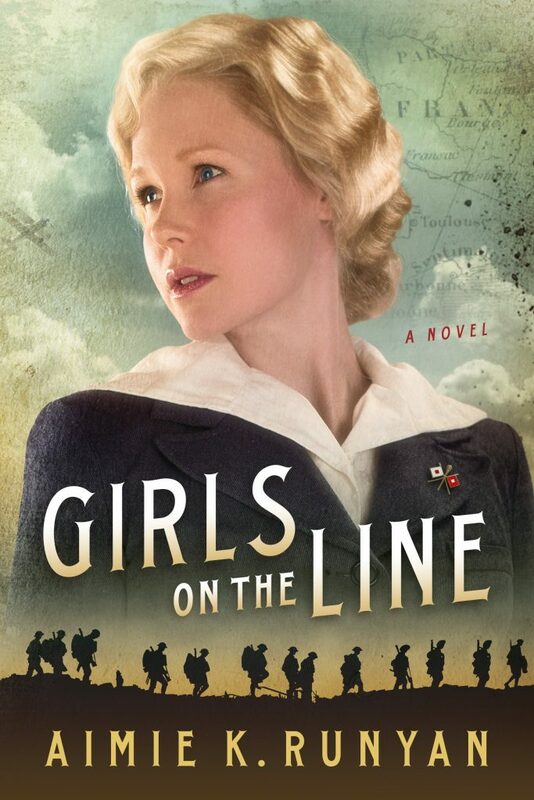 The female camaraderie of GIRLS ON THE LINE is one of the novel’s emotional highlights. If I hadn’t been reading GIRLS ON THE LINE while in a public place (on an airplane), I would’ve burst into noisy tears at chapter 32. In a good way. When a book affects me like this, I want to understand ‘why?’ because it means the author has made me care about the characters so that when something good or bad happens to them, I’m also there emotionally. So how did Aimie Runyan achieve this? By building a picture of Ruby as the driving force behind the team. She dives right in and shows us the kind of person Ruby is. From the beginning, we know that Ruby is a young woman with a strong sense of justice and duty, and that she isn’t a social climber like her mother. Aimie makes this believable with some backstory: Ruby still remembers her childhood from before her father made his fortune. So at her job with Pennsylvania Bell and later in the Army, Ruby downplays her family’s wealth and treats everyone as an equal. When a new friend is the target of discrimination, she stands up not just to defend but verbally accost the offender. By the time Ruby she is picked to be chief operator, it’s believable because we’ve seen her leadership qualities. We see how her steady-going, compassionate nature holds her team together as they carry out their duties under hellish conditions. She’s a big sister as much as a supervisor, but so busy worrying, giving, and caring that she’s not as aware as she could be of the trust and affection she’s earned. So when the girls on the line pitch in to celebrate some good news, I got all teary-eyed, because Ruby finally and deservedly realizes how much she means to them. Compared to Aimie, I’m rather slow when it comes to revealing character, with a tendency to meander. But now I see how establishing character firmly and early on helps underpins the story arc so that you can pick up the pace and move ahead with plot elements that are driven by character. DUH, you say. But until I picked apart this example, I didn’t see how to do it better or how important this was. From now on, I’ll work harder at establishing character sooner and more forcefully. Thank you, Aimie! I love Aimie’s books. Thanks for this blog. Now I can’t wait to read it.